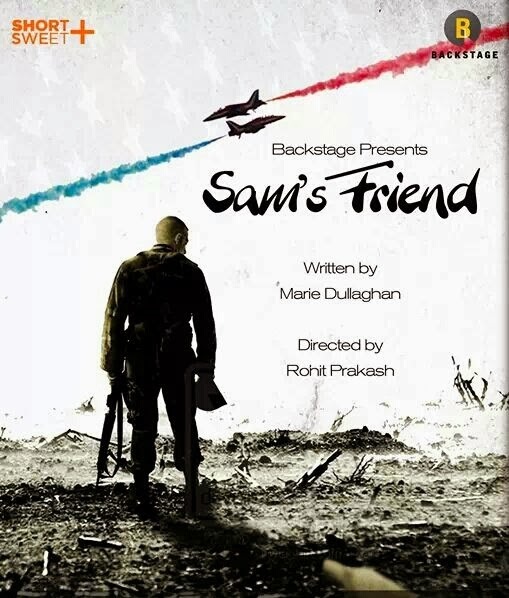 When I saw the production list for “Sam's Friend” I was delighted. I am a great admirer of Backstage and have watched this theatre group go from strength to strength. Consequently I look out for any production that they put on. Shihas Salim caught my eye in Backstage’s Production of Hamlet in November last year where he played Horatio and I have been looking forward to seeing what this young man could do given the opportunity. I have been a longtime admirer of both of Rohit Prakash (Runner Up Best Actor Short and Sweet 2013) and Rashmi Kotriwala as actors. Then I saw that Sam's Friend was a locally written play. Any sort of creative writing undertaken for public consumption is a brave, bold and romantic endeavor. Writers have my unwavering admiration and I was thrilled to see Backstage taking advantage of Dubai based writing talent in the shape of Marie Dullaghan. I was nicely set up to enjoy the show before I even saw it. This is a double edged sword, if the play does not live up to one's (that would be me) hope filled expectations one (me again) is a crushed fan! But I was not disappointed. I really do believe that a good script sets up a show. Even the best of performances cannot hide poor writing. This script was well thought out and strong. 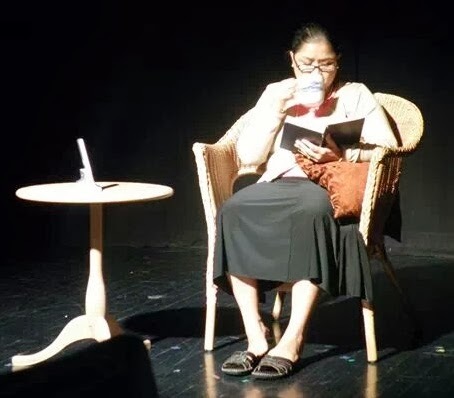 Marie Dullaghan is a familiar face in the dramatic community of Dubai with both her and her husband Frank being passionate writers, directors and actors of their own works and those of others. This was, for me, the best of the works I have seen performed that was written by Marie. The cast had a top class script to work with. This was justly recognized with Marie being awarded the "Best Locally Written Play Script" at this year’s Short and Sweet. The ten minute play highlights the relationship between a mother and her son. It hovers between the spaces of what is left unsaid in relationships. It is about protecting those you love and wanting to be protected. It is about not having all the information you need to maneuver your way around a relationship and saying the wrong thing at the wrong time and the consequences thereof. Heavy stuff. The cast rose to the challenge presented by the depth of the script and gave engrossing performances. I was engaged in Sam’s pain. A good performer gets you personally involved in the character and Shihas had the audience with him all the way. As the story unfolds and we, the audience, slowly realize what Sam’s situation is, and who he is, and what is his trying to tell his mother our heart go out to both of them. You so want them to get it right. I held my breath for moments at a time, willing Sam to tell his mother the truth. The expected (by then) but yet still somehow shocking moment when we see Sam move to leave the stage was heartbreaking. Shihas' interpretation of Sam thoroughly deserved the "Runner up Best Actor" award he received. It was a standout performance and I expect to see much more from him. Rashmi Kotriwala as Sam’s mother gave us mighty fine performance. Her joyful expectation at her son’s homecoming was clearly expressed and her confusion and then pain was beautifully played against Sam’s kindly misleading revealing of his condition. The relationship between mother and son was gentle and sad and utterly believable. You could feel the love between them. Sam’s mother’s realization at the end of the play of what she has done was subtly and beautifully performed by Rashmi. Both players gave strong supportive performances and I was spell bound. Director Rohit Prakash takes a fair amount of credit for this. He took a good script, good actors and wove a special story for his audience. The direction was subtle. 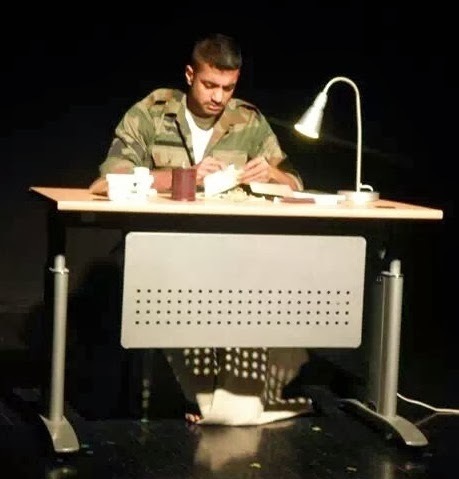 The gentleness and sorrow that permeates the play was gracefully directed. Movements and moments were contained. The mother's concerns for her old age with her gently rubbing her knee. Sam nervously fiddly with the paper on his desk, not so much that it intrudes into the action but enough to build the tension. Small things were considered in this production, there was attention to detail that many directors might miss. My only criticism is that I would have arranged the set differently. I would have had mother and son closer together on the stage and maybe had then angle slightly away from each other. I did not want to miss a bit of the subtle actions and was looking from one side of the stage to the other to get it all in. Rohit did a fine job with this play. "Sam’s Friend" was a wonderful coming together of talent and commitment. I do hope we get to see more from these very talented individuals who are growing in scope and ability. Please note that all the photographs and pictures here are from the Short and Sweet facebook page or from the Backstage facebook page.